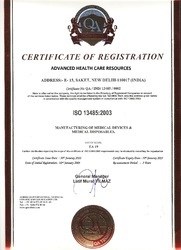 "Advanced Health Care Resources" was established as a sole proprietorship in the year 2004. Owing to our compliance with international standards of manufacturing. Due care is taken to ensure adherence to safety standards at all levels. The comprehensive product range offered by us includes Pulselith Pneumatic Lithotripter, telescopes, instruments for Cystoscopy or Ureteroscopy, and instruments for Resectoscope. Gamut of specialized products offered by us is highly customized as per the specifications provided by our clients. Besides special care is taken to ensure we fabricate best quality products with accurate dimensions, high effectiveness. The products that we offer are affordable. We have sound infrastructure assisting us to fabricate and export our quality products. Our infrastructure comprises of design unit, fabrication unit, quality control unit, R&D department and warehousing and packaging department. Our well versed research and development department takes due care to ensure that inculcating of advanced technology and new market trends are taken good care of. Our quality control department ensures that each product is duly quality checked at each stage of development. Since we are highly focused on quality compliance, our quality products have enabled us to establish ourselves in the domestic market as well as in the markets of Indian Subcontinent, East Asia, Middle East and South East Asia. Owing to our expertise in manufacture of quality range of medical equipment, we have been able to create a niche of our own in the market. Our products are fabricated using excellent grade raw material, putting into use advanced technology. All the international safety standards are complied with while we manufacture our comprehensive range. All our products are available at affordable prices. The range of products offered by us includes Nephroscopy, instruments for Uretero-Renoscopy, Continuous Flow Hysteroscopy Sheath without instrument Channel and Urology disposables. Apart from that we also offer Pulselith Pneumatic Lithotripter, telescopes, instruments for Cystoscopy or Ureteroscopy, and instruments for Resectoscopy to our worthy clientele. Precision, quality and a firm belief in perfection has resulted in constant up-gradation of technology and expansion of the existing production facilities to suffice changing and exacting demands. Which means having the best of men and machines. And we ensure to assist our clients through consultations regarding products & usages, by providing instant technical support and relentless customer care. We are determined to provide our client with premium quality product. And are well prepared to explore the new market demands with our quality products with zeal and passion involving our skill and experience of years with today’s modern techniques. We invite channel partners, dealers & sub-dealers to flourish. We have earned a huge clientele on the basis of our products. The products fabricated by us find vast use in the medical sector especially hospitals, nursing homes, laboratories, and other health institutions. Healthy Life Pharma works with an extremely professional attitude, that is familiarized to achieve desired results intended for clients' full satisfaction. Whilst maintaining whole ethical business practices, the firm administers an alliance with its clients for common business interest. Currently, Healthy Life Pharma is exporting its pharmaceutical assortments to the various anticipating markets across the world. We are one of the leading manufacturers and suppliers of the Endourology Equipment and Medical Equipment, which are fabricated from fine grade of raw materials. Our range of products is high in demand in various countries of East Asia, South East Asia, Middle East and Indian Subcontinent. We offer a wide range, which includes Telescopes, Instruments for Cystoscopy / Ureteroscopy, Pulselith Pneumatic Lithotripter, Urology Disposable and many other instruments. We are supported by a hard working and highly energetic team, making us to overcome all obstacles easily. They have helped in taking good work from our resources. Owing to their experience and technical expertise, our team has remained as a corner stone in all our endeavors. Our team comprises of engineers, technicians, researchers, quality control staff, consultants and other skilled and semi skilled staff. Special attention is paid for quality inspection of our products. Our R&D experts conduct regular researches to inculcate new researches in our products and working helping us to remain up to date with current trends. Our expertise in manufacture, export, wholesale and trading of comprehensive product range of medical equipment, we have achieved a reputation in the industry. Enabling us to move on the citadel of success quickly our client centric approach and ethical business has been pivotal. Our products have created a niche of their own in the market.